I have been experimenting with face masks for quite a long time and now it seems that I found my favourite ones! So I was using simple clay masks for a really long time, probably since I was twelve. I had blackheads then for the first time and I hated them. Mud masks worked well and I still think they are one of the best options. At least for ones who does not have very sensitive skin. The trick is to not let them dry. Constantly spray thermal water on top, and it will clean your skin without drying it out! I also use the moroccan clay, rhassoul, which contains essential oils and smells really strong but i kinda like it. It exfoliated my skin very well and gives me a fresh looking skin. When I was at uni I was not actually into skincare anymore. I had an impression that nothing could help me. I would just put moisturizer and follow it with foundation and some consealer over my blemishes. The only thing I have never skipped on was taking my make up off. No matter how tired I was, I would remove it before going to bed. Because when I didn't my skin looked so much worse. Sometimes I would use a mask, like once every two months. My sister bought me the Mask of Magnaminty from Lush, but it was quite harsh and didn't do much for my skin. Another one that I used was The Body Shop Blue Corn. It was quite harsh too, but I really liked it. I actually still use this one. It cleans your skin very well, but when you put it on it can be very tingling. Then I started living alone and decided to start over to make my skin look nice again. I started using products containing acids and it really worked for me. I cannot say that my skin got better overnight, but it was much better after a couple of months. This is when I noticed that my skin became very sensitive. It does not react to the essential oils very well now, so I try to use them less often, though I am still hypnotized by the smell . I tried to find an alternative to pure clay masks and switched to the other ones that contained clay, but were balanced by calming ingredients. Caudalie makes a very nice clay mask for sensitive skin, Vinopure Clarifying mask. I bought it a couple of times. It worked well, but it did not have that wow!! effect on my skin. And I wanted to see the real difference. This is when I found REN masks. I read a couple reviews on beauty blogs and decided to give it a try. I found a stater kit one day and bought it directly. It contained the two of my now favourite masks as well as some other products. 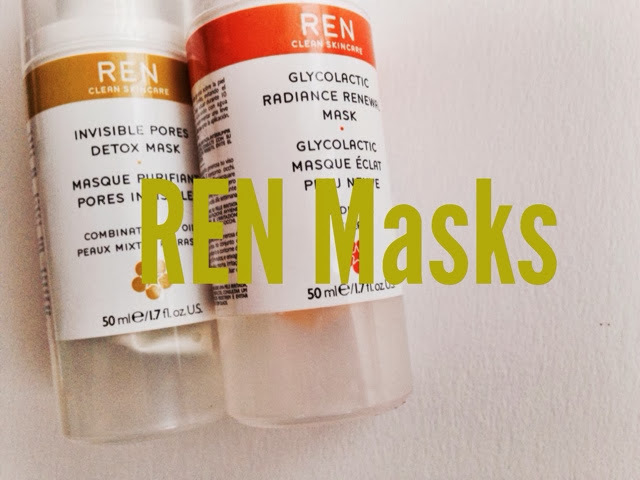 The REN Invisible Pores Detox mask is my all time favourite now. I always make sure that I have one at home. It cleanses your skin and calms it down at the same time. A dream product. I use it when I have some breakouts or my skin feels a bit red and irritated. I just pop it on and 10 minutes after you can already see the difference! Another favourite of mine is their Glycolactic Radiance Renewal mask. It helps me to get rid of my under-skin blemishes and to even out my skin tone. When I feel that I will have one of these, I just put some directly on the spot. Leave it on for as long as you can, or even overnight. 99% of the time it will be gone in the morning. After using these two, I ordered the Clearcalm one. I read a lot of positive reviews, but unfortunately it breaks me out and I really do not like the smell. I guess the problem is that my skin doesn't really enjoy glycerin. But I am looking forward to trying some other products from REN as they make a great amount of wonderful products. Thank you so much for reading and I hope it was helpful!